The scope of censorship of keywords and images on WeChat related to Liu Xiaobo expanded greatly after his death. Our analysis of WeChat keyword-based censorship shows that after his death messages containing his name in English and in both simplified and traditional Chinese are blocked. His death is also the first time we see image filtering in one-to-one chat, in addition to image filtering in group chats and WeChat moments. Based on an initial analysis of Weibo’s suggested search keywords, we surmise that there continues to be genuine user interest in producing and finding Liu-related content using alternative keywords. On July 13, 2017, Liu Xiaobo, China’s only Nobel Peace Prize winner and its most famous political prisoner died from complications due to liver cancer. He was detained in December 2008 for his participation with “Charter 08”, a manifesto that called for political reform and an end to one-party rule. In June 2017, eight years after his imprisonment, he was diagnosed with terminal liver cancer. The government of China rejected his request for permission to receive medical attention abroad, for which they were widely criticized. Following his death, news articles reported cases of social media in China blocking references to Liu Xiaobo and his legacy. In this report we analyze censorship related to Liu and his death on two of China’s most popular platforms: WeChat and Sina Weibo. On WeChat, we collected keywords that trigger message censorship related to Liu Xiaobo before and after his death. Before his death, messages were blocked that contained his name in combination with other words, for example those related to his medical treatment or requests to receive care abroad. However, after his death, we found that simply including his name was enough to trigger blocking of messages, in English and both simplified and traditional Chinese. In other words, WeChat issued a blanket ban on his name after his death, greatly expanding the scope of censorship. We documented censorship of images related to Liu on WeChat after his death, and for the first time found images blocked in one-to-one chat. We also found images blocked in group chat and WeChat Moments (a feature that resembles Facebook’s Timeline where users can share updates, upload images, and short videos or articles with their friends), before and after his death. We analyzed search term blocking on Weibo and confirmed that it maintains a blanket ban on searches for Liu Xiaobo’s name. In fact, just his given name of Xiaobo is enough to trigger censorship in English and both Simplified and Traditional Chinese, something that was not true as recently as June 14 according to monitoring by GreatFire. An initial analysis of Weibo’s recommended search keywords, suggests that users continue to have an interest in Liu-related content and use alternative keywords as a workaround. Social media platforms in China regularly censor content related to Liu Xiaobo and his legacy including “Charter 08” and being awarded the Nobel Peace Prize as shown in previous research and user reports. However, the death of Liu marks a particularly critical moment for the Communist Party of China (CPC) and, as a result, Chinese Internet companies are facing direct or indirect government pressure to apply broad restrictions to content related to Liu. In this report, we analyze how WeChat and Weibo adapted and evolved their censorship efforts in response to Liu Xiaobo’s death. Liu Xiaobo was one of China’s most famous human rights activists and China’s only Nobel Peace Prize winner. He participated in the 1989 Tiananmen Square student protests, advocated for democratic reforms in China, and was an author of “Charter 08,” a manifesto signed by Chinese advocates and intellectuals that called for political reforms and an end to one-party rule. Liu was jailed in 2009, charged with “inciting subversion of state power” and sentenced to 11 years imprisonment for his role in “Charter 08”. On June 26 2017, after spending eight years in prison, it was announced that Liu had been diagnosed with late-stage liver cancer. He was subsequently released from Liaoning Jinzhou Prison to a hospital under guard. His death was first announced by The Bureau of Justice in Shenyang city in northeastern China where he was being treated for liver cancer. He died in the hospital on July 13, 2017. Liu Xiaobo’s death is a politically sensitive event for the CPC. The 1989 Tiananmen Square student protests grew out of a public mourning of Hu Yaobang after his death. Hu was a popular political figure who advocated for market and political reform, including for greater government transparency. Like Hu, Liu was a popular symbol of political reform and freedom, and his death could potentially rally the public to mourn or cause embarrassment to the authorities. To control the narrative around Liu’s illness, the CPC strictly regulated physical access to him. It denied his request to receive medical treatment overseas, despite repeated calls from NGOs and governments, including from German Chancellor Angela Merkel, who asked Beijing for a “signal of humanity for Liu Xiaobo and his family.” Beijing nevertheless resisted, saying he was already receiving the best possible care in China and citing Liu’s fragile health, disagreeing with the medical opinion of two foreign doctors who visited Liu and who deemed him strong enough to leave the country. Analysts have suggested that Beijing feared that if he had left the country, Liu could again speak out against Beijing and gain the world’s attention. WeChat (Weixin 微信 in Chinese) is the most popular chat application in China and the fourth largest in the world, with 768 million daily active users. It thrives on the huge user base it has amassed in China, but the Chinese market presents unique challenges. Internet companies in China are required to follow laws and regulations on content monitoring and censorship. Failure to block sensitive content can lead to fines or revocation of operating licenses. Our previous research shows that that WeChat keyword-based censorship is enabled for users with accounts registered to mainland China phone numbers. Censorship for these types of accounts persists even if these users later link the account to a non-Chinese number. The censorship is not transparent: the message containing a sensitive keyword simply do not appear on the receiver’s end and no notice is given to the sender that their message is blocked or why it was blocked. Compared to one-to-one chat, we also found that more keyword combinations are blocked on group chat, where messages can reach an audience of up to 500 users. WeChat can censor a message based on whether it contains a blacklisted keyword combination. A keyword combination consists of one or more keyword components. When a keyword combination consists of only one component (e.g., “劉曉波”), then a message is filtered if it contains that component. For a keyword combination that contains more than one component (e.g., “刘晓波” and “习近平”), a message is censored only if every component in the combination appears somewhere in the message, although not necessarily adjacently. In this case censorship rules may be implemented more precisely. WeChat performs censorship on the server-side, which means that messages pass through a WeChat server that contains rules for implementing censorship. If the message includes a keyword combination that has been targeted for blocking, the entire message will not be received. Documenting censorship on a system with a server-side implementation requires devising a message of one or more keywords to test, running that message through the app, and recording the results. We conducted tests to document keyword-based filtering on WeChat from July 2016 to July 2017. We extracted keyword combinations from front page articles of Chinese-language international and independent news media websites to use as a testing sample (see Appendix A). In previous work we found that extracting keywords from these news sources was effective for tracking events and themes that are subject to censorship over a defined time period. On July 13, following the announcement of Liu Xiaobo’s death, we retested all related keyword combinations we previously found blocked. We used a script to collect URLs to news articles, using RSS where available, and alternatively from articles listed on the site’s front page. 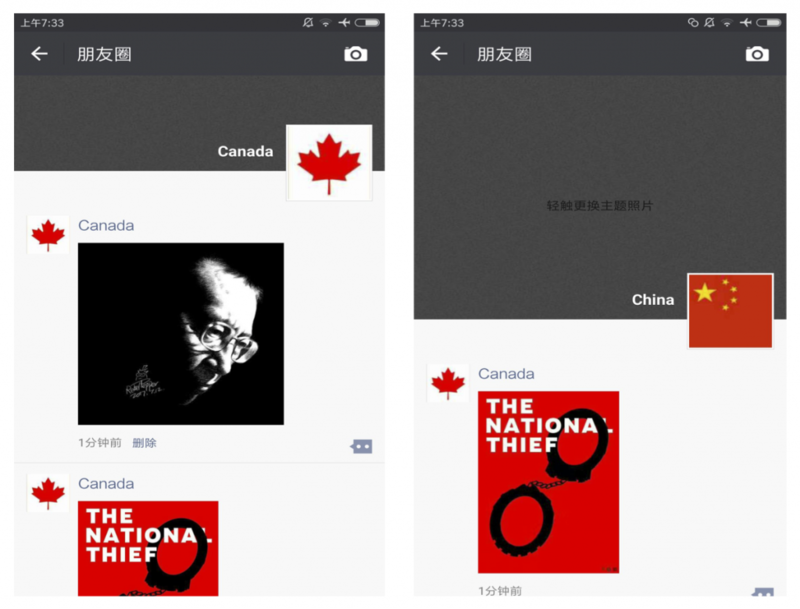 Article titles and body text were extracted from each link and sent into a WeChat group chat using four test accounts (two registered to mainland Chinese phone numbers and two registered to Canadian phone numbers). If we found text from the article was censored we then reduced the text down to the minimum number of words required to trigger censorship. Between July 1 2016 to July 11 2017 we found 30 keyword combinations censored. All 30 combinations were found blocked in group chat with 19 of these also blocked on one-to-one chat (See Table 1). Keyword combinations censored prior to the announcement of Liu Xiaobo’s cancer diagnosis focused on his advocacy legacy (see Table 2). Following the announcement that Liu Xiaobo was diagnosed with terminal cancer the content of keyword combinations focused on his illness, his request for medical treatment abroad, and the politics surrounding his situation (See Table 3). From July 13-14 we found 30 new censored keyword combinations. All 30 combinations were blocked on group chat with 22 blocked on one-to-one chat. Table 4 shows the language of the combinations found blocked across group chat and one-to-one chat. The content of the keyword combinations blocked after Liu Xiaobo’s death are much broader in scope. Blocked combinations included general references to his death (e.g., “晓波” + “去世”, Xiaobo + died) and even his name alone, effectively censoring any messages on WeChat that reference him. Testing conducted on July 13 found that Liu Xiaobo in Traditional Chinese characters (“劉曉波”) and English were blocked in group chat and one-to-one chat. On July 14, Liu Xiaobo in simplified Chinese characters (“刘” + “晓波”) was found blocked on group chat (see Table 5). Our previous research shows that image censorship occurs in both WeChat’s chat function and WeChat Moments. In September 2016, Chinese authorities issued regulations stating explicitly that messages and comments on social media products like WeChat Moments can be collected and used to investigate legal cases. Recent cases of WeChat users arrested for “insulting police” or “threatening to blow up a government building” on WeChat Moments indicates that the feature may be subject to monitoring by the authorities or the company. 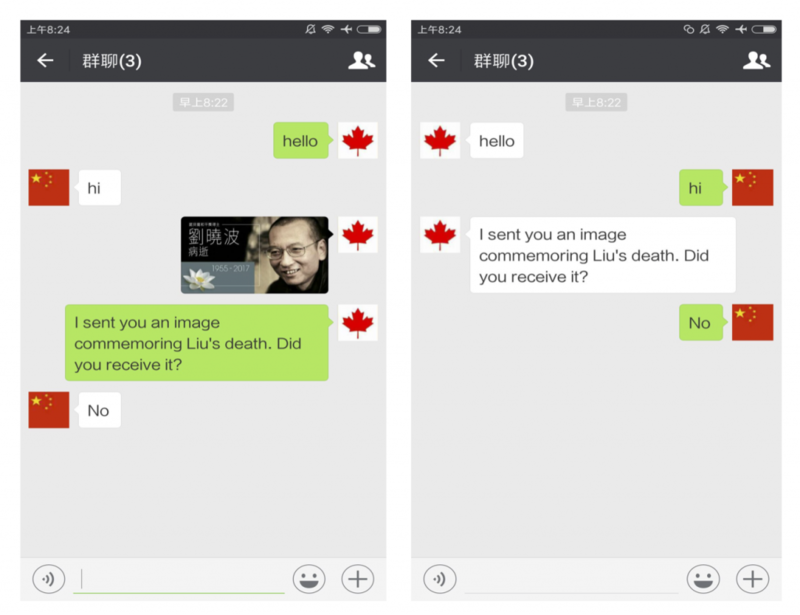 Following Liu Xiaobo’s death we found that WeChat filters images related to him on both chat functions (i.e., one-to-one chat and group chat), as well as on WeChat Moments. This event is the first time we have documented image filtering on WeChat’s one-to-one chat function, showing that the censorship over the Liu Xiaobo event is more extensive than WeChat image censorship we previously documented. Between July 12 11:30pm and July 14 11:30am (EDT), we automatically collected images posted to Twitter with the #LiuXiaoBo hashtag in Chinese language tweets. We performed the data collection using the Twitter Public Streaming API. We used the filter predicate “pic twitter com #LiuXiaobo”, where “pic twitter com” was used to filter for tweets with embedded images (images hosted on the pic.twitter.com domain) and where “#LiuXiaobo” filtered for tweets with that hashtag. Our testing consisted of two phases. The first phase only tested images collected through July 13 11:30am (EDT) and occurred during the afternoon of July 13 (EDT). This sample consisted of 50 images from 50 unique URLs. The second test phase consisted of all images collected during the entire collection period and occurred during the afternoon of July 14. In this phase we tested 119 images from 119 unique URLs, including the 50 from the previous sampling period which we retested. Overall, we found 74 images blocked on WeChat Moments, 26 blocked on group chat and 19 blocked on one-to-one chat. 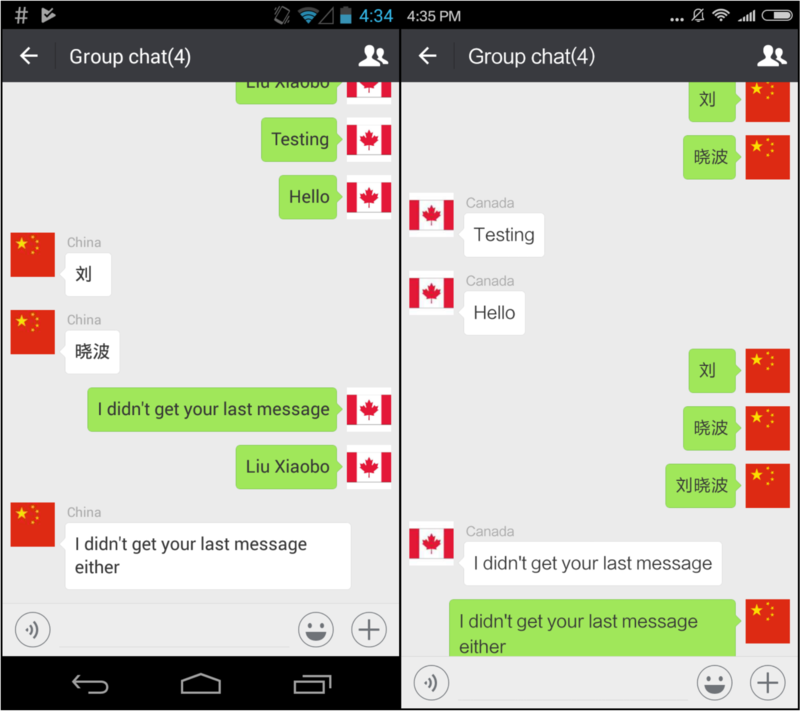 These are the first tests in which we have found evidence of image censorship on WeChat’s one-to-one chat. In previous research testing image filtering related to the 709 Crackdown case, we found images blocked in group chat and WeChat Moments, but not on one-to-one chat. Images blocked on one-to-one chat were also blocked on group chat and WeChat Moments. Images blocked in chat functions were always blocked on WeChat Moments (See Figure 2). Twenty-nine images were uniquely blocked on WeChat Moments. The greater attention to WeChat Moments and group chat may be due to the semi-public nature of the two features. Messages in these functions can reach a larger audience than one-to-one chat, potentially making these features subject to a higher level of scrutiny. However, the blocking of images on one-to-one chat shows an effort to restrict content across semi-public and private chat functions, demonstrating the sensitivity of Liu Xiaobo’s death. It is unclear why only a subset of the images blocked on group chat were also blocked on one-to-one chat. It would be technically convenient to enforce censorship of the same sets of images in chat functions. One possible explanation is that censorship in smaller, more private spaces is most disruptive and noticeable to users as opposed to ones with larger audiences. Figure 2. 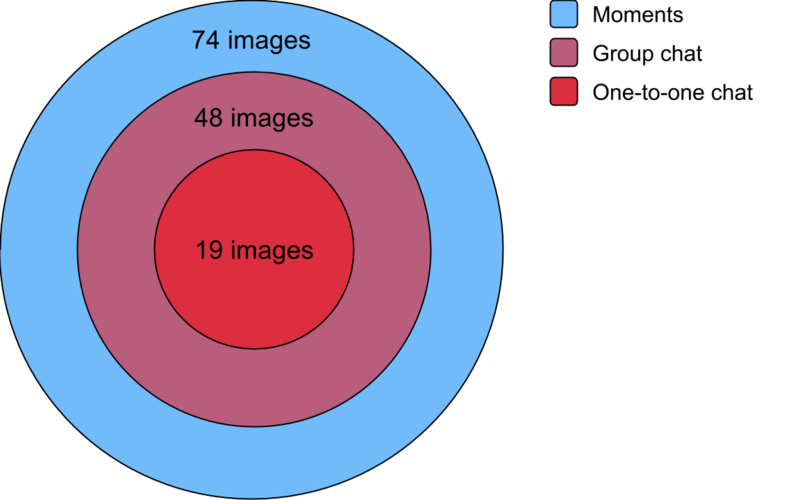 Diagram showing how many of the 119 images tested on July 14 that were blocked on each of three different WeChat features. All images blocked on one-to-one chat were blocked on group chat, and all images blocked on group chat were blocked on WeChat Moments. Similar to keyword-based filtering, censorship of images is only enabled for users with accounts registered to mainland China phone numbers. The filtering is also not transparent. No notice is given to a user if the picture they sent is blocked. Censorship of an image is concealed from the user who posted the censored image. Figure 3 shows a user with an international account successfully posting a censored image: the image is visible to users with international accounts, but the post is hidden from users with China accounts. Figure 3. Evidence of image censorship in WeChat Moments. A user with an international account (on the left) posts an image of Liu Xiaobo, which is hidden from the Moment’s feed of user with China account (on the right). Examples of blocked images include photos and cartoons of Liu Xiaobo and empty chairs symbolizing the Nobel Peace Prize awarded to Liu, screenshots of censorship related to Liu on Sina Weibo, and news articles reporting Liu’s death. The 19 images that were blocked in one-to-one chat are predominantly images and symbols of Liu Xiaobo, and people commemorating him. One of the blocked images was a screenshot of conversation between two Chinese people, who used homonyms (“习禁平”, Xi Ban Ping, the character 禁 sounds like “jin” but means “banned”) of Chinese President Xi Jinping to criticize the authorities’ increasing control over the Internet. Figure 4. Evidence of image censorship in WeChat one-to-one chat. 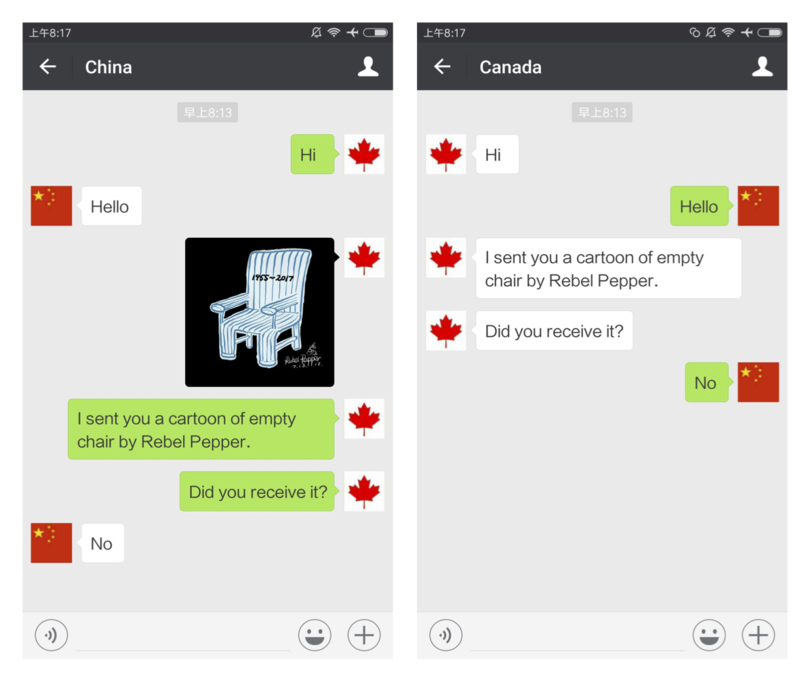 A user with an international account (on the left) attempts to send an image of a cartoon of an empty chair symbolizing Nobel Laureate Liu Xiaobo to an account linked to a mainland Chinese phone number. The image is not received by the China account user. Figure 5. Evidence of image censorship on WeChat’s group chat. A user with an international account attempts to send an image commemorating Liu Xiaobo’s death in a group chat. Users with China accounts in the group did not receive the message. The exact mechanism that WeChat uses to determine which images to filter is unclear and in our testing sample we found unexpected results. 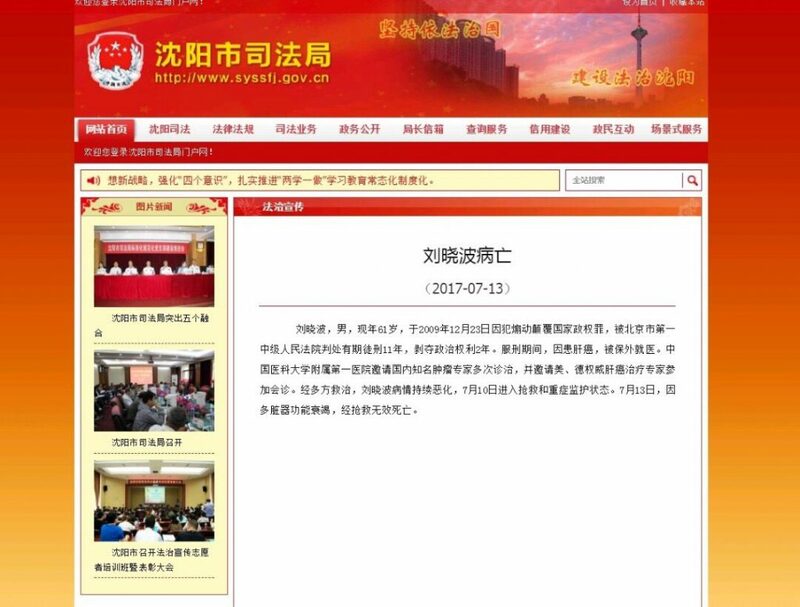 Blocked images included screenshots of official government statements on Liu Xiaobo’s death, which we did not expect to be censored (see Figure 6). We also found images that were not blocked that could be seen as sensitive, such as an image of book covers of “Charter 08” and a Biography of Liu Xiaobo, which are both banned in mainland China (See Figure 7). Figure 6. 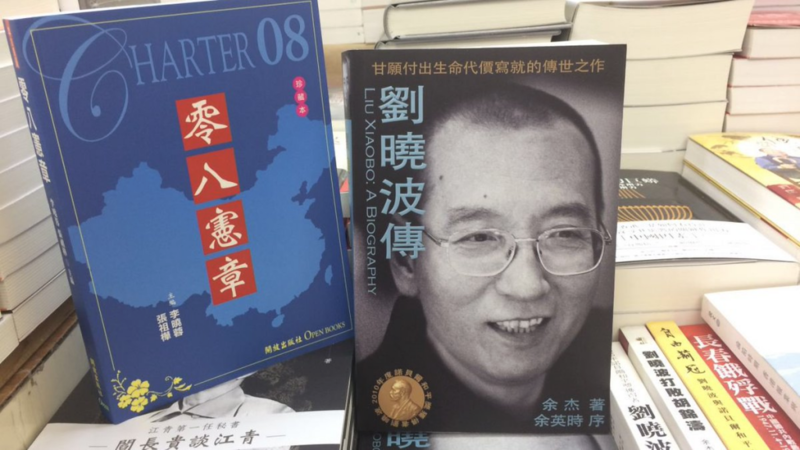 Image of books on “Charter 08” and a Biography of Liu Xiaobo, which are both banned in mainland China. The image was not blocked on WeChat. Figure 7. Screenshot of the official announcement of Liu Xiaobo’s death issued by The Bureau of Justice in Shenyang city. The image was censored on both group chat and WeChat Moments. Sina Weibo is a popular social media platform in China that users have historically congregated on during sensitive moments like national catastrophes and the passing of important figures. The platform has a more public nature than WeChat; Weibo is similar to Twitter in that posts are by default viewable by all users, even including those who are not on the platform. Anecdotes and past research show it is a more restrictive platform for the sharing of content than WeChat. 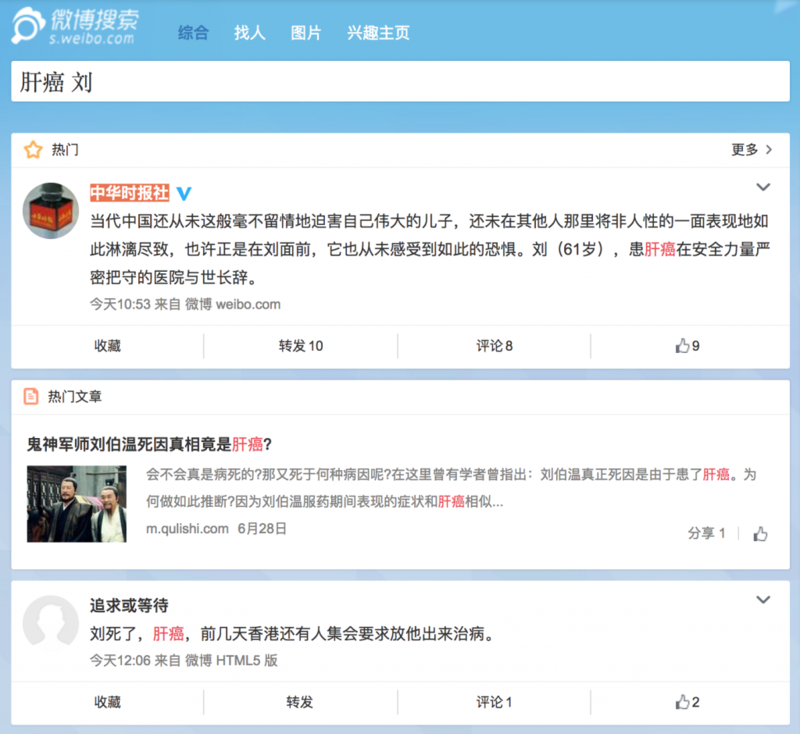 Weibo allows users to search the entire platform for relevant posts. Past research has found that search results are heavily filtered. We confirm through testing done after Liu’s death that there is a blanket block on any search terms containing Liu Xiaobo’s name in English, simplified Chinese, and traditional Chinese. This search blocking does not seem to be a reaction to Liu Xiaobo’s recent illness or death as his name has been fairly consistently blocked on Weibo search in recent years. However, since his passing, even searches that only contain his given name (Xiaobo, 晓波, or 曉波) are blocked. According to testing by GreatFire, his given name was accessible as recently as June 14. Like WeChat, Weibo has intensified censorship, recognizing that Liu’s passing is a particularly sensitive event. Weibo’s more restrictive baseline as compared to WeChat may allow for a more seamless user experience during moments of particular sensitivity. Users may not be upset if they cannot find content related to sensitive events if they have been normalized to a certain level of censorship on a platform. And yet, despite years of becoming accustomed to censorship, we still see examples of Weibo users similarly complaining (see Figure 8) about how their posts have been censored and how they are being restricted from searching for any content using Liu’s proper name. 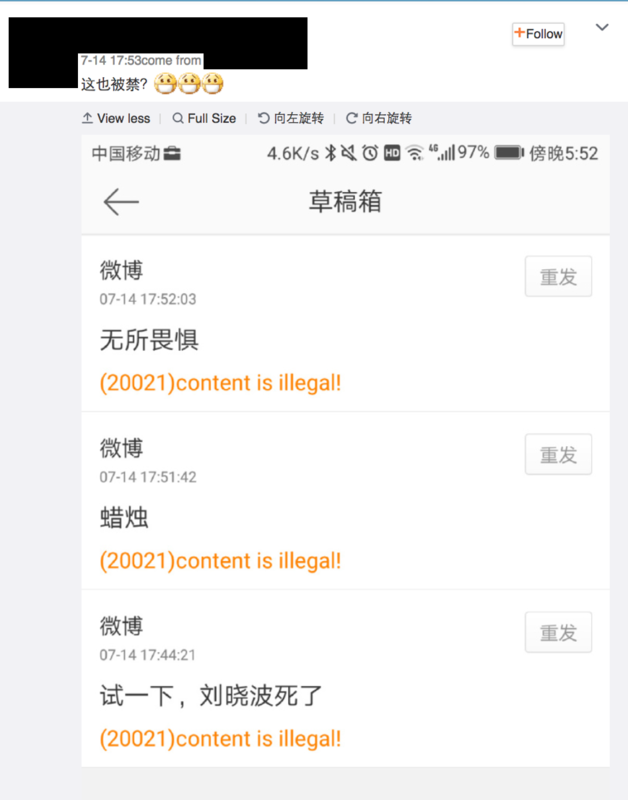 Figure 8: A Sina Weibo User posts a screenshot with a comment: “This is also forbidden? ” Translation of the text in the screenshot which the user attempted to post before getting a “content is illegal!” error, from top to bottom: 1) I have no enemies. 2) Candle. 3) Trying this one, Liu Xiaobo (alternative characters) is dead. Although censorship on Weibo has made finding information about Liu using his proper name impossible, we can still assess that there is interest in Liu-related content in a number of ways. A user could use alternative keywords for Liu (such as homophones or coded references) to search for related content. For example, media reports indicate that alternative ways to reference Liu include “Wang Xiaobo” and “Teacher Liu”. We tested these keywords in Weibo search and found neither was particularly effective at uncovering relevant search results, with any potentially relevant content either buried in search results or hidden altogether. But if one were not already familiar with such alternative terms being used by others, it would be near impossible to find relevant information. To get around this restriction, a naive user could potentially use Weibo’s own suggested keywords to find relevant, uncensored content. Figure 9: Left: A search for “liuxiaob” recommends search terms like “刘小bo”. Right: A search for “liver cancer” returns “liver cancer Liu” as a suggested keyword. With Liu’s passing, we experimented with whether this method might produce relevant results. We took nine Liu Xiaobo related keywords (code for the keyword extraction and testing; Google Sheet of results) and ran them through the suggested keywords API returning 201 keywords. Not all of these keywords were relevant to Liu but others were and included sensitive topics (e.g., references to Liu and liver cancer, and homophones of Liu’s name). None of the suggested keywords in our testing sample were censored. The specific algorithm that drives how these keywords are suggested is unclear, but a preliminary results shows a number of interesting traits. For many keywords, an autocomplete feature will recommend queries based on partially-entered searches. This search feature is common on search engines such as Google. For example, searching for 肝癌 (liver cancer) returns auto-suggestions like 肝癌 去世 (liver cancer, pass away) and 肝癌 刘 (liver cancer, Liu). However, when users enter terms in pinyin, the suggested keywords algorithm converts the search request and returns possible Chinese search terms. For example, entering “liux” will return suggestions like “刘xiao” and “刘小博”; “liuxiaob” returns “刘小bo”. And in cases when a partially-entered query contains blocked keywords or is too specific, the user does not receive recommendations. These suggestions are sensitive to current events, suggesting they are likely informed by query logs (stored user input) — curating or pre-vetting search suggestions would be very labor-intensive. Because the recommendations contain sensitive keywords, this hypothesis seems reasonable. In Figure 10, a search for 肝癌 (liver cancer) suggests 肝癌 刘 (liver cancer, Liu). If this is indeed the case, the existence of suggested keywords like this and others like 刘小博 and 刘小 speak to continued attempts by users to search for information about Liu and their experiments in using alternative keywords to find the information they want despite initial censorship. It appears that suggestions are ordered by some integer value which appears to measure the number of searches that have been made using a specific keyword. Our initial analysis shows that this number is much higher for searches for Liu Xiaobo-related content than is searches for other keywords related sensitive current events (Guo Wengui, Wang Qishan, etc.). Leaked directives and previous research shows that Chinese social media companies receive greater government pressure around critical or sensitive events. Consistent with this previous research, our findings document a significant shift in censorship after Liu Xiaobo’s death. While it is not known what specific directives may have been sent down from the government, given the high sensitivity of his death it is likely companies received instructions on how to handle it or may have proactively sought out official guidance. Before his death, limited talk about Liu on WeChat was allowed, as long as it did not touch upon certain sensitive topics such as his medical care or “Charter 08”. In contrast, after his death, the censorship became more expansive and blunt, to the extent that any mention of him is no longer tolerated. Similarly, following his death his given name (Xiaobo) alone is enough to trigger censorship on Weibo signalling increased controls on the platform. What explains this development? It might be because of the authorities’ fear for the potential of collective action, but our findings also suggest that censorship exists to help the authorities’ save face or avoid embarrassment. For example, the keyword combination of his wife’s name “Liu Xia” (刘霞) and “house arrest” (软禁) triggers censorship; it is possible that this is done to minimize the potential of collective action, but it is more likely that this is done to make sure the authorities do not appear to be cruel or unjust. Another example of a keyword combination that triggers censorship that is likely to prevent the authorities from looking uncaring are those related to Liu’s illness and medical care, such as the keyword combination of “Liu Xiaobo + abroad treatment + difficulties in eating” (刘晓波+进食困难+出国治疗). If the blanket ban of Liu Xiaobo is a reaction to this particular sensitive moment in time, is it possible that discussion of Liu Xiaobo will open up again after a certain period, or will he remain blocked forever, erased from history? Will the Chinese people know or remember who is Liu Xiaobo? In comparison, there are signs that the Chinese, especially the younger generation, are already slowly forgetting about the 1989 Tiananmen Square student protests. Continued monitoring of social media in China is necessary to assess if Liu Xiaobo’s death will act as a momentary spike in censorship or the beginning of a sustained effort to wipe him into a collective amnesia. Authors are listed in alphabetical order: Masashi Crete-Nishihata, Jeffrey Knockel, Blake Miller, Jason Q. Ng, Lotus Ruan, Lokman Tsui, and Ruohan Xiong. Special thanks to Ron Deibert for review and supervision. List of news sources monitored for WeChat testing. Radio Free Asia Mandarin Radio Free Asia (自由亚洲电台) is a privately funded, international broadcasting corporation that broadcasts and publishes online news to listeners in East Asia while “advancing the goals of U.S. foreign policy.” Its Chinese website focuses on politics and dissident news in China. RFA is blocked in China. The New York Times Chinese The New York Times is an American daily newspaper. Its Chinese site has been blocked since 2012 when it published an article on the wealth of former Chinese Premier Wen Jiabao’s family. Financial Times Chinese The Financial Times, published and owned by Nikkei Inc. in Tokyo, is an international daily newspaper. Its Chinese website focuses on business and financial news in mainland China, with occasional reporting and commentaries on Chinese politics and foreign policy. The website is currently accessible in China. Radio France Internationale Chinese Radio France Internationale is a French public radio service that broadcasts in Paris and all over the world. Its Chinese-language radio service first started in June 1989. RFI’s websites are blocked in China. Lianhe Zaobao Lianhe Zaobao (联合早报) is the largest Singapore-based Chinese-language newspaper. The paper establishes itself as a serious broadsheet with extensive local news coverage while international news tend to be largely centered on the East Asia region, especially China. The site is currently blocked in China. Deutsche Welle Chinese Deutsche Welle is Germany’s public international broadcaster. Its Chinese website, which focuses primarily on mainland China and Europe-China news, is currently blocked in China. Voice of America Chinese Voice of America is a United States government-funded multimedia news source. Its Chinese website primarily focuses on mainland China news. The website is blocked in China. The Initium Media Launched in 2015, the Initium Media (端传媒) is a rising Hong Kong–based digital media outlet that provides news to Chinese-language readers worldwide. The website is blocked in China. BBC Chinese The British Broadcasting Corporation (BBC) is a British public service broadcaster. Its Chinese website translates or provides original BBC reporting on China issues. The website is currently blocked in China. Ming Pao Ming Pao (明報) is a Hong Kong based newspaper known for its reporting on political and economic issues in mainland China and Hong Kong. Its website is currently blocked in China. Hong Kong ON.CC Launched in 2000, on.cc is a news website of the Oriental Press Group, a large Hong Kong media publisher. Its website is currently blocked in China.